The Villages Golf & Country Club in San Jose, California is located in the picturesque Evergreen foothills of Santa Clara County. It offers residents resort-like facilities in a setting that embraces the area's natural beauty. Amenities are plentiful at four community clubhouses where residents can choose from over 100 community organizations, committees, and social clubs. The lush community grounds include stables and bridle paths for riding, a championship golf course, over 500 acres of open space, and beautiful lakes offering two and a half miles of shoreline. The gated, 1,200-acre community is designed for active adults aged 55 and better. Set among rolling hills, Villages Golf & Country Club feels secluded yet is close to shopping, dining and recreational attractions found throughout California’s thriving South Bay area. The Villages is located on San Felipe Road, and is less than two miles off of Highway 101. 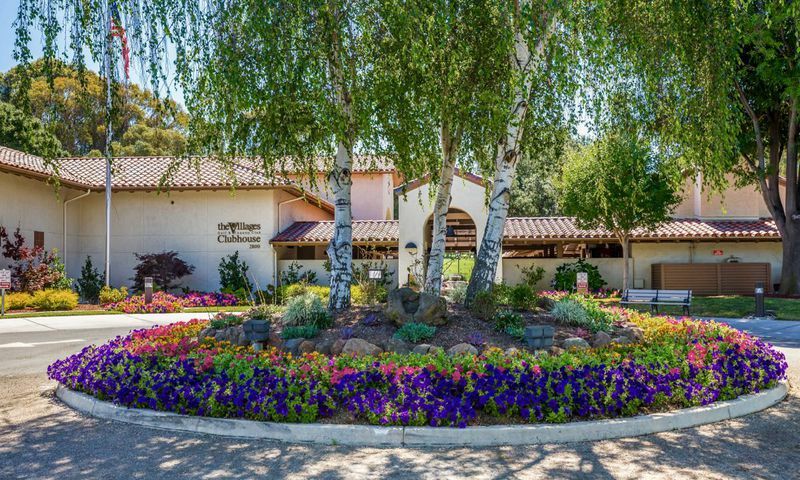 Though the open, natural setting may feel luxuriously remote, only 10 miles separate The Villages Golf & Country Club from downtown San Jose, CA. Social activities are offered through four community clubhouses at The Villages in San Jose: The Cribari Center, Foothill Center, Montgomery Center, and Vineyard Center. Each center offers different facilities such as a fitness center, library, card rooms, and even a special boutique for selling resident hand-crafted items. Specialized rooms are available for those interested in hobbies, such as photography, woodworking, or billiards. Various party and meeting rooms are also available at each center. For dining, The Villages Clubhouse restaurant offers diners an impressive menu as well as incredible views. Homeownership at The Villages in San Jose, California includes membership to the golf and country club. For golf enthusiasts, the community boasts a championship 18-hole golf course designed by Robert Muir Graves, as well as a 9-hole par-3 course, a driving range, and pro shop. Residents who join the riding club have access to the community stables and seven bridle paths. Given the beautiful environment, outdoor activities are popular at The Villages in San Jose, California. In addition to golf and riding, the community offers six tennis courts, seven hiking trails, four pools and spas, three picnic areas, and two bocce ball courts. The Villages' beautifully planned homes appeal to discerning buyers. Designed with an eye to variety, the community contains twelve villages, each offering homes of differing architectural styles, sizes and price ranges. Mature landscaping enhances the scenic beauty of the homes located in The Villages in San Jose, California. There are 2,536 homes in The Villages Golf & Country Club of San Jose consisting of 2,309 attached condos or townhomes and 227 single-family homes. The Villages is largely comprised of two bedroom and two bathroom townhouses and condos, though some one and three bedroom homes are available. These comfortable homes range in size from 600 to 2,256 square feet, and are available at reasonable prices. Those who live at The Villages Golf & Country Club in San Jose tend to be highly active and with over 100 community organizations and social clubs from which to choose, residents are sure to find appealing activities. Health-conscious residents can stay in shape at the fitness center that's located in the Montgomery Center clubhouse or they can get their exercise outdoors through activities such as golf, swimming, horseback riding, tennis or hiking. Built over what was once vineyard and agricultural estates, more than 500 acres of open space provide hiking and riding trails with breathtaking views that lend a beautiful setting for outdoor activities. Residents actively participate in social clubs, committees, and hobbies. Facilities such as craft rooms and dark rooms for photography are available at the community clubhouses and the boutique at the Cribari Center allows residents to sell their hand-crafted items. Some popular social clubs at The Villages in San Jose, California include the amateur radio club, bridge club, dog lovers club, ethical humanist club, flower ladies arranging guild, hiking club, music society, recreational vehicles club, riding club, and various golf related clubs plus many others. Though The Villages' 1,200 acres feel like their own world, the community is located less than ten miles from downtown San Jose, in an area also known as Silicon Valley. Nearby Highway 101 allows easy access throughout South Bay, which is a subregion of the San Francisco Bay area. San Jose is located at the southern end of the San Francisco Bay area. It is the largest city in the area and the third largest city in California. San Jose is home to many museums, restaurants, shopping centers, festivals, performing arts, and major sports teams. There is truly something for everyone in this bustling city, whether it's an afternoon of shopping, a night on the town, or touring with visiting grandchildren. For even closer shopping, the Eastridge Shopping Mall offers a wide variety of stores, including both major department stores and smaller specialty shops, and it is conveniently located only six miles from The Villages of San Jose, California. The Villages Gold & Country Club was thoughtfully designed in a convenient location with a variety of homestyles perfect for today’s active adult in California's Bay Area. The Cribari Center is the main clubhouse that is located on Cribari Lane. Here, residents can find everything need to stay physically and socially active. The Foot Hill Center is at the intersection of Fairway Drive and Village View Drive. This is the perfect place for hosting club meetings or parties. This facility holds up to 125 people. The Montgomery Center is off of Montgomery Lane and Wehnery Way. This facility is the perfect place for group meetings as it holds up to 50 people. The Vineyard Center holds up to 70 people and is located at the intersection of Villages Parkway and Fairway Drive. Below is a list of outdoor amenities found throughout The Villages Golf & Country Club. There are plenty of activities available in The Villages Golf & Country Club. Here is a sample of some of the clubs, activities and classes offered here. Village Cribari was the first village built in 1967. There are 94 one and two-story building with 576 villas. On average these homes are 1,233 square feet. Please Note: Not all floor plans are available at this time. Village Montgomery was built in 1971 with 75 single-story buildings and 351 villas. Note: Due to the age of the community some floor plans may be missing. Village Heights was built in 1978 and consist of 23 one and two-story buildings with 72 villas. Please Note: Floor plans are not available at this time. Village Glen Arden was built in 1989 with 25 two-story buildings with 120 villas. Homes range in size from 1,265 to 1,804 square feet. Note: Due to the age of the community some floor plans may be missing. Village Del Lago was built in 1985 and is comprised of 55 one and two-story buildings with 174 villas. Note: Due to the age of the community some floor plans may be missing. Village Olivas was built in 1992 and consists of 165 single-story buildings with 207 villas. Note: Due to the age of the community some floor plans may be missing. Village Valle Vista was the last village to be built in 1999. It is comprised of 29 single-story buildings with 72 villas. Note: Due to the age of the community some floor plans may be missing. Village Fairway was built in 1996 and is the smallest village in the community. There are eight single-story buildings with 22 villas. The homes range from 1,415 to 1,675 square feet. Note: Due to the age of the community some floor plans may be missing. Village Sonata was built in 1998 with 42 single-story building and 102 villas. Home range in size from 1,639 to 1,969 square feet. Note: Due to the age of the community some floor plans may be missing. Please Note: Not all floor plans are available at this time. Village Hermosa was built in 1975 and is comprised of 146 one and two-story buildings with 196 villas and 74 single-family homes. Note: Due to the age of the community some floor plans may be missing. Village Verano was built in 1980 with 86 one and two-story building and 207 single-family homes. Note: Due to the age of the community some floor plans may be missing. Village Highland was was built in 1987 and consists of 115 single-story building with 210 villas and 49 single-family homes. Note: Due to the age of the community some floor plans may be missing. The Estates is enclosed by Village Olivas and consist of 75 single-family homes. Note: Due to the age of the community some floor plans may be missing. I recently closed on my new home and am discovering all the fun things there are here. It was very convenient to prescreen homes before scheduling a visit. Very private, wonderful amenities and beautiful landscaping. I have lived here for 3 years and just love everything. It is nearly impossible to find a community with horse stables and trails plus all the other high-end amenities here like the golf course, restaurant, fitness center and pools. I am also very active in community events and clubs. I have made lots of wonderful new friends and we enjoy taking turns hosting our little informal weekend brunch dates. Gardening and photography are two of my favorite activities and thanks to the clubs here I've learned how to take amazing pictures of my lovely little garden! 55places.com is not affiliated with the developer(s) or homeowners association of The Villages Golf & Country Club. The information you submit is distributed to a 55places.com Partner Agent, who is a licensed real estate agent. The information regarding The Villages Golf & Country Club has not been verified or approved by the developer or homeowners association. Please verify all information prior to purchasing. 55places.com is not responsible for any errors regarding the information displayed on this website.